Hi loves! Today I have swatches of 2 dark Too Fancy Lacquer beauties. I am kinda kicking myself for waiting so long to swatch these.. because they are really really pretty! Oh well, at least I get to show them to you now? Both are currently not available but you might stumble upon them somewhere - Too Fancy Lacquer The Night Porter is an exclusive or Rainbow Connection UK and Too Fancy Lacquer Counting Stars is just a "regular" release. Too Fancy Lacquer Counting Stars is a unique beauty, especially in the Too Fancy Lacquer collection, since it isn't a holo but a duochrome! And such an amazing one.. It mainly goes from purple to emerald green, but it's like 5 shades of purple and 5 shades of green, and then there's some blue in it as well, and to make it even better there are these gorgeous golden flakies in it! Formula is great as well, first coat seemed a bit thin and patchy but the second coat made it well covering, smooth and opaque. I finished with a layer of topcoat. Too Fancy Lacquer The Night Porter is produced exclusively for Rainbow Connection UK. It's an amazing shade, at first (when looking at it in the bottle) I thought it would be a near black linear holo, but it's not. It's a warm coppery shade! I love the depth in this shade and how rich it looks. Also, it has that amazing, buttery, opaque in almost one coat TFL formula that I love so much <3. Yup, it's perfect! Again, finished with topcoat. I am so mad at myself for letting these babies sit unattended for so long! But I am definitely happy I discovered their true beauty, because now I'll definitely wear them more often. The formula was best on The Night Porter but I love the colorshift and golden flakies in Counting Stars. How do you feel about these dark shades? Fancy any of them? My bottle of Counting Stars is sitting in a pile of untrieds, too (( shame on me! I really should give this baby more love. I really liked Counting Stars. I need more duochromes in my life. 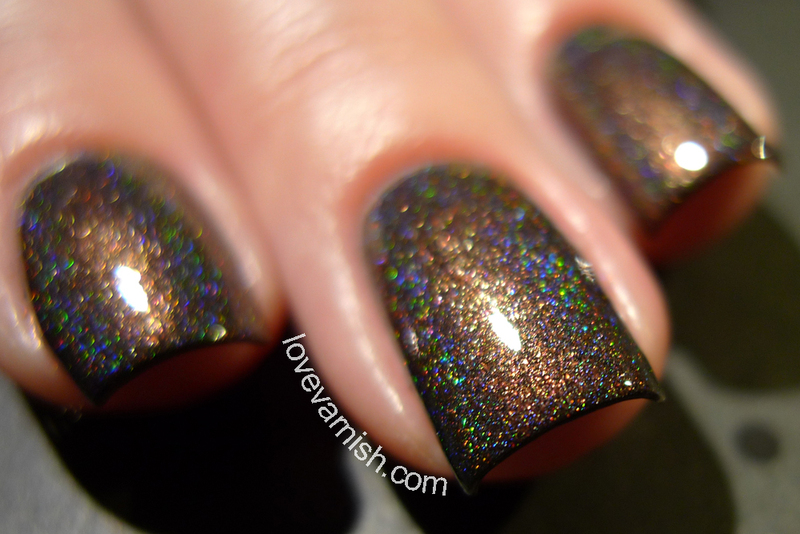 These are both lovely, especially the holo. I've never tried TFL, but clearly I must! As much as I love the holo polish, the duochrome in Counting Stars made it my favourite! Just beautiful! Ohhh, these are both really gorgeous!! I love Counting Stars! Both of these are simply stunning!! I can't really pick a favourite, both shades are gorgeous! Holy wow on the Night Porter!! I love how warm it is, it definitely makes a difference! Both of the shades are so beautiful. There is just something about your macros that make me fall in love. I generally don't lean towards those dark brooding shades but The Night Porter is gorgeous. They are both gorgeous, as usual for TFL! Counting Stars is my favorite!! I've never seen a polish like it!!! I can really recommend trying it, it's even more impressive in person! Duochromes always surprise me :) it's so much fun to see the colors change with the angle of your nails. Thanks Marisa, I think that shade would look fabulous on you as well.